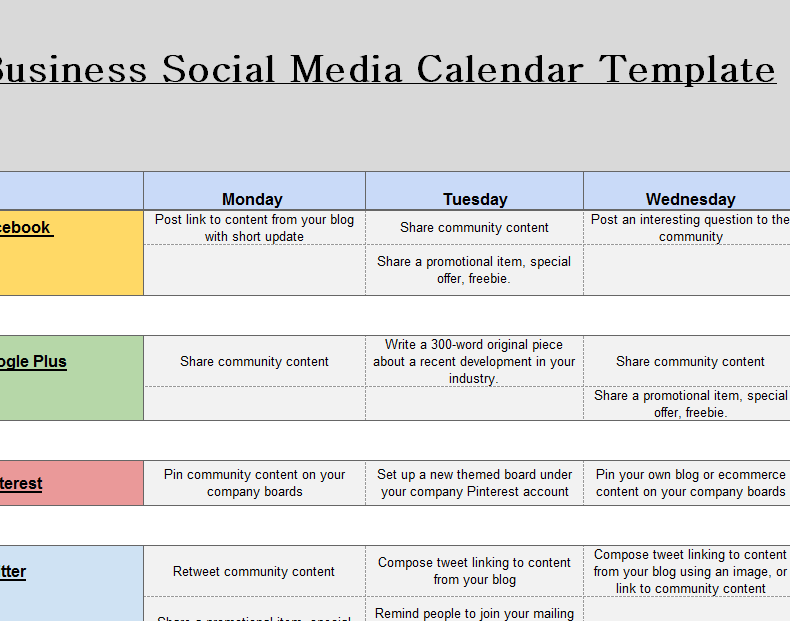 The Social Media Business Calendar will help anyone flourish in the new age of digital marketing. Social media marketing has become a major strategy for small businesses and major corporations alike. However, as with most things in life, this type of marketing will require some work. This template helps you organize your various social media posts to all the popular outlets available to you. Best of all, the template is designed to be as quick and efficient to setup as possible. No more struggling to remember if you posted an important status update or missed a crucial tweet, this template has you covered from every angle. To download the document directly to your computer, simply click the link below! Obviously you have to choose which social platform will work best for you and your business. The template gives some of the most popular sites, but you can easily change or delete these. Just click inside the cell you wish to change and type something new. The template will give you a Monday through Friday weekly calendar in which to enter your information. In the table containing the social platform you want to post something in, just choose the day and write the details of your post under that day. All the platforms are separated into different colors to help you easily navigate through your sites. At the very bottom of the template, there is a table titled “All Platforms”. In this table, you can remind yourself to write the same post for all your social media profiles. Another way to help speed up your posts is to hyperlink your ideas directly to the site. This way you can just read a piece of information from your Social Media Business Calendar and quickly transition to writing it. You’ll also notice all of the tables have been split in half. The top section of each row is where you can write the general idea of your media post and the bottom is where you will list more detail. This is useful if you don’t yet have a clear idea of what you want to write but a general grasp of what you want to say. By using this document, you can organize your information for one of the strongest marketing platforms in the world. This template is sure to lead you to success, and it’s absolutely free!